Dr. Hugo De Burgos, originally from El Salvador, is an anthropologist, filmmaker, activist and professor at UBC Okanagan campus. 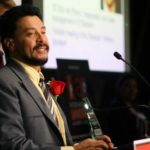 After his mother was kidnapped and disappeared in the 80s, Dr. Hugo De Burgos fled El Salvador to Mexico, and then came to Canada, at 18 years old and alone. Dr. De Burgos is a multiple award-winning anthropology professor/researcher at the University of British Columbia, filmmaker, and a respected international activist, his latest recognition is to be among the “Ten Most Influential Hispanic/Canadians of 2013”, as well as the Paul Farmer Award for outstanding anthropology teaching. In 2010, he won Public Anthropology’s Eleanor Roosevelt Global Citizenship Award for inspiring university students to take part in the global community and act responsibly; less than 1% of anthropology professors in North America receive this award. He also received two Izaak Killam Memorial Scholarships, the Government of Canada’s Social Sciences Award, and is a member of both the American and the Canadian Society of Anthropology. His research interest includes: cross cultural psychiatry, social inequality and health, visual anthropology, applied medical anthropology, Central American indigenous medicine and identity.